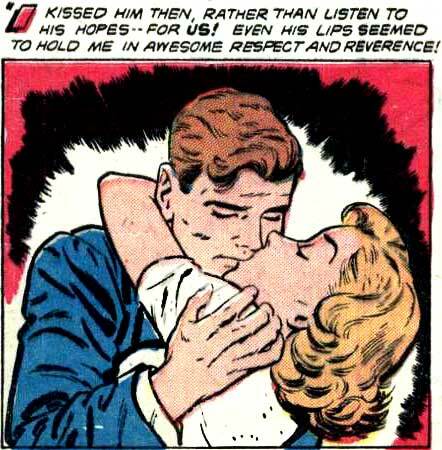 MAN (kissing a woman): She’s everything I’ve ever wanted in a woman…horny! MAN (kissing a woman): She’s everything I’ve ever wanted in a woman...horny! I am curious and would like to ask a question if I may. “Kiss and Run” seems to make a lot of appearances. Is this just a favorite story? Or just one that’s easy to work with? Thanks. 1) I like the art. 2: I have very high quality scans of the original art. And the art was nice and clean to begin with. So the art’s very easy to work with. In the later half of 2017, I decided to have Diego Jourdan Pereira concentrate on mostly just coloring art for me—rather than re-inking AND coloring. This was cheaper for me and faster for him. So, I went through and picked out every useable panel from “Kiss and Run” and sent the scans to Diego to color. This may be more than you want to know, but in most cases when I’m having art colored, I just have scans of the art stats that I got from Charlton. The stats are the same size as the printed comics and are much, much smaller than the original art. So it’s always preferable to scan original art when I can get it. I do own some original romance art, but the “Kiss and Run” art as well as some other art was loaned to me by the good folks at Dark Star Books (http://www.darkstarbookstore.com) who I met years ago at a Chicago convention. A few minutes later, I’d somehow talked Dark Star into allowing me to borrow the art; take it home to Seattle to scan it; and then mail it back to the store. It was an incredibly kind (and trusting!) thing to do! That was pretty cool of Darkstar. Interesting peek into the behind the scenes as well. Thanks. I appreciate it.